This rug seems to be of nice quality and I bet a lot of people would really love it! I just wasn't crazy about the pattern and color. We returned it and kept a different one for our foyer instead. 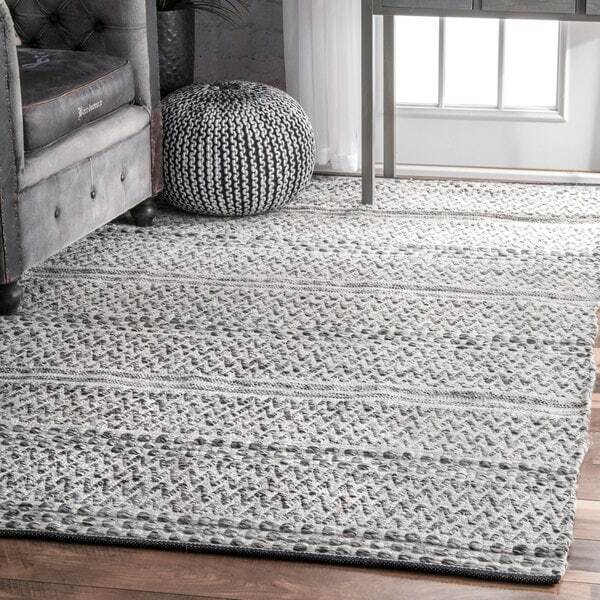 Soft and sturdy, this versatile area rug can be used to elevate your living room or dress up your patio. The flat-woven polyester pile features a plush, grey chevron pattern and rubber-yarn stitching for added durability. Choose from seven versatile sizes to perfectly fit your space. I really like this rug and decided to keep it despite the color being different from the picture. While the picture looks like muted grays, the rug has a fair amount of black in it, so there is more contrast across the colors than what appears in the picture. Really like the texture of this rug & it’s held up well with 2 toddlers and a dog. It’s best to vacuum without the roller spinning, as it does pull up the material a bit. Would recommend, but it does have a stinky odor, that has dissipated over time but 6 mo later is still noticeable if you sit on the floor. Needs maintenance... not well made. This rug is very loosely woven, in a way it isn't woven at all, but stitched together with medium weight thread. The various yarns come loose and create tufts that stand straight up like your hair when you get up in the morning. You either have to cut off these tufts (not a good plan) or get out a needle and thread and sew them back down. Disappointed in the quality. If you can live with the repairs, it is a pretty rug. The rug itself is nice, but nothing at all like the pictures. It is not grey, but more black and and white. This is a great rug. The color is more grey in tone but very close to the picture. Also soft on your feet and would definitely order again if I could find another room to use it in! This is and excellent rug in our great room! We love it! Durable, yet comfortable for teenagers to play with pets on the floor. Would highly recommend! Bought this because I was looking for something multi colored but similar tones that can look good but also handle dogs - we have two Bernese mtn. Dogs! Love the rug was unsure about it at first but I love the texture and tones of gray goes great in our living room I wish it were a 5 by 7 but that's because of my space I have it in- here is a picture of how we styled it with our living room! Love the variety of color in this rug. We put it in our master closet and it matched perfect our closet drawer color. Brightens up the floor and feels good on bare feet too! I was so excited to get this rug but when it came it looks nothing like the color in the picture. 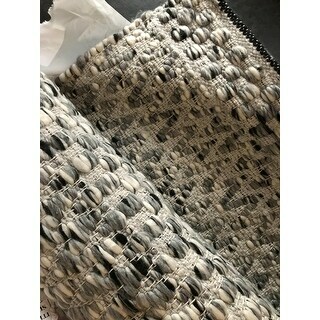 This is has more black, white, and gray all mixed together rather than light silver/gray like the picture. The design and textures are also much more pronounced. It seems like a good quality rug, but it just didn’t go with the room. The color is nothing like it is in the picture. 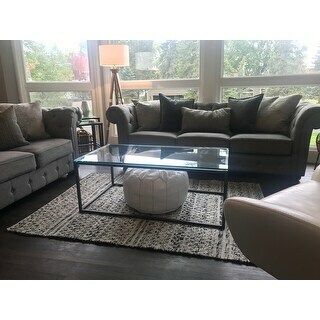 It is a black, grey and white rug, not grey/muted. Very lump and "rough" looking. Had to return. I love this rug! We chose it for an indoor rug because we have dogs and usually indoor/outdoor rug is easier to keep clean. It adds a lot of warmth to the room, highly recommend. Pretty but think it was a little pricey for the actual look. This is a very high quality, beautiful rug. I love the woven look of it and it provides such great texture to the room. I think it's probably more fitting for an indoor space, unless your patio is covered. The coloring is a little different than the pictures. It is very prominently black, gray and white and a lot bolder than the pictures show. But it still worked great for my space. I love it and would definitely purchase it again! It's so so cozy to walk on! 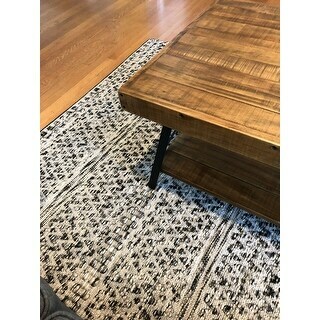 This rug looks nothing like the photo. Much darker!! The loom work is very loose and wouldn't be durable at all. Very disappointed and cost *** to return. This rug was recommended by our decorator and we could not be more pleased. It is the perfect transition rug from indoor to outdoor for a neutral color scheme that needs a chunky, hardworking pop of texture. The rug is much thicker and of better quality than I anticipated. LOVE!!!!! Love the black and grey color scheme. Since it is woven, the edges aren’t perfectly straight. It’s a great rug for our entry room and seems to be holding up well for people coming in through the front door. "Is this rug safe for vinyl planking?" "Does this rug come in 3x5?" Yes, the nuLOOM Flatweave Chevron Striped Indoor/ Outdoor Patio Silver Area Rug (3' x 5') but is currently out of stock until November 2018. "Does this rug come in 6 x 9?" Unfortunately, this is not currently available in that size. "Does this rug come in 5x7? Thanks!" No, this rug is not available in 5 X 7.